Should Retailers Accept Expired Coupons? Coupons are a valuable marketing tool for businesses. Some companies find so much success with them, that they keep them in wide circulation at all times. But to drive urgency, businesses have long attached expiration dates to the coupons they create. That creates a dilemma, however, when customers arrive at the location with an expired coupon. Does the business reject the coupon and risk alienating the customer, or accept the coupon and set a dangerous precedent? Here are both sides of the argument to help your business make a fully-informed decision. Today’s customers are savvier than ever about prices. Before they arrive at a retail location, they’ve likely spent time researching the product online and have full awareness of the suggested retail price, as well as the discounts offered by competitors. Price-comparison tools have only made it easier for customers to quickly compare and find the best price on a given day for any product. A business that accepts coupons of all types has an advantage over the competition. When a store is in line with competitors on a certain price, a coupon can give your store the edge in a customer’s shopping decision. 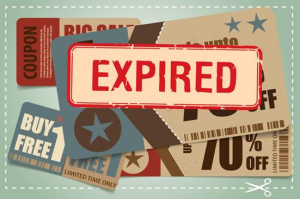 However, seeing an expiration date on that coupon can easily drive a customer to competitors. By establishing that it will not only accept expired coupons but coupons from competitors, as well, a retailer increases customer loyalty and shows a commitment to customer service. Some businesses may find accepting expired coupons sets a harmful precedent. The point of an expiration date is to drive urgency and once loyal customers learn that date means nothing, the point of having a date printed on it in the first place comes into question. Soon loyal customers will tell their own networks about the meaningless expiration date and a business may as well remove the expiration date altogether. Still, all of that word-of-mouth marketing can be beneficial to customers. When someone has a coupon in hand and is comparing prices, that person may remember what a friend said about a business’s coupon policy and decide to shop there over a competitor’s store. Additionally, a willingness to honor coupons despite expiration dates shows a commitment to customer service that customers see as a good sign. With retailers in all industries competing for customers, it is important to be able to win customers over through as many methods as possible. Price-comparison tools give customers instant access to pricing information across all retailers, making it difficult to remain competitive. By following pricing trends using a pricing tool like PriceManager, you can combine your generous coupon acceptance policies with good pricing to win new customers and encourage loyalty among the ones you already have.